• Innovative formulation stoichiometric molar. • Covers 100% of gray hair. • Lightening 4/5 tones with super lightening. • Reflection intensebrilliant thanks to the use of micro - pigments of high qualitycertificates and of European origin. • All colors can be mixed with each otherexcept toner. • Result homogeneoustrue to the color chart. • NATURAL.0 : guarantees perfect coverage of white hair. It is ideal to support the covering effect of all the Ashes series. • NATURAL INTENSE.00 : formulated for those who appreciate covers more precise. • NATURAL.08 MAT : dedicated to ethnic hair (African - South American - East). Specific tints to counteract unwanted orange / yellow and orange. It is not recommended to apply in the presence of white hair. • ASH.1: ideal for cold reflectionsto mitigate the bright reflections of already colored hairor deal with the warm tones that are evident during the lightening of naturally dark hair. Media coverage of white hair on high rates to get 100 % of the coating effect is preferable to use in blend with the natural series. • ASH INTENSE.11 : ideal for reflections particularly coldto mitigate the bright reflections of already colored hairor deal with the warm tones that are evident during the lightening of naturally dark hair. Please do not use in the coverage of white hair on high rates to get 100 % of the preferred coating effect is mixed with the Natural series. • BEIGE.2 : a series of beige or ash -free red tints. Ideal for delicate blondeprovide good coverage of white hair. • BROWN.23 : collection created for those who love the brown sandand a viable alternative to existing (.24). • INTENSE BROWN.24 : very suitable for those who love Mediterranean colors and fully appreciate the nuances hot and intense. • GOLDEN.3 : to get warm golden hues, excellent effect of coverage even on a high percentage of white hair. Spice up the natural colorsattenuates the intensity of the series very heated without compromising the effect of brilliance. • GOLDEN COPPER.34 : recommended for those who want to get the hot blonde bright. For the best coverage of gray hairmix with the series Golden or Natural. • COPPER.4: these colors are orange reflections in light tonesbrownish in the midtones. For the best coverage of white hair blended in the Natural series. • COPPER GOLD.43 : brown colors are bright in the mid-tonesauburn delicate in light colors. Good coverage of white hair covering the maximum effect is achieved in the mixture with the series Gold or Natural. • MAHOGANY.5 is a collection suitable for anyone but the bright colors but not too showyits formulation is the right compromise between brown and red. • RED.6 : To make bold and bright reflections on mid-tones, in order to achieve the maximum coverage of white hair mixed in the series Gold or Natural. • PURPLE 7 : To make bright purple highlightsto cover the whites mix together the series Golden or Natural. • TONER T: Returns intensity of tone and shine to the color faded or light strokes. 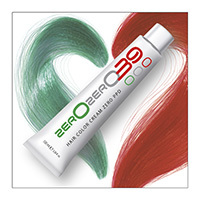 For use only with Cream Activator 0039. • OFFSET C: formulated on the heights of tone 6. versatilemodular ideal for strengthening and intensifying the color or to achieve a particular effect on bleached hairtransforming the reflection in a brilliant color composition. • SUPER LIGHTENING - SS has no power to cover the white hair andto get a good result in the use of this range it is advisable to work on in the natural 6/7. Instruction to use the possibility of using 3 different services: for traditional coloring mixed with oxygen in a 1:1 ratio5, for tone-on- tone use in a 1:2 ratio and color bath in a 1:3 ratio. Container: 100 ml tube.